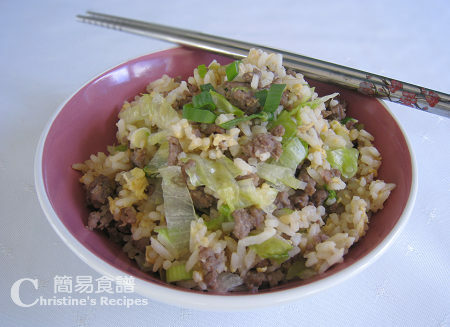 Here’s my favourite dish for all seasons, Fried Rice with Minced Beef (生炒牛肉飯), which is also a very popular one-dish-meal offered at any Chinese restaurants. The rice has to be sty-fried really hot. 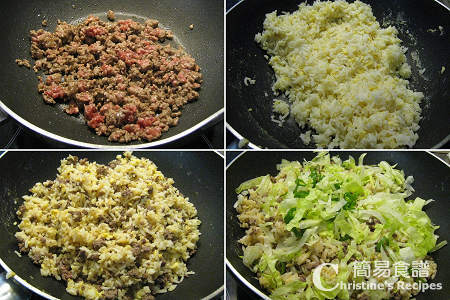 Having combined with the fresh minced beef and crunchy lettuce, this dish is very healthy and nutritious. When it comes to frying rice, I love adding heaps of meat and vegetables. It’s also suitable for elderly or young kids, helping them intake more protein and veggies. Marinate minced beef with marinade for 15 minutes. Heat oil over medium. Cook beef until 80% done. Set aside. Add some oil again. Stir in beaten egg. Stir constantly until 60% done. Add rice, preferably reheated beforehand as it’d shorter the cooking time. Quickly stir fry evenly. Sprinkle salt and sugar to taste. When the rice is really hot thoroughly, add light soy sauce. Toss in beef. Continue to cook and combine well. Add shredded lettuce and spring onion until softens. If you’d like to taste the crunchy veggie, then don’t fry too long. Serve hot. You might like to take a look at my previous post: Tips on Frying Yummy Rice. I love this dish too! So simple yet so delicious nad satisfying. Taste so different with minced pork. I also tried to fry with minced pork..delicious too. thank you for this recipe. I'm going to make it for my Chinese school project. It looks very yummy. hopefully I can succeed in cooking it. Hi, I tried this recipe today but was having trouble marinating the ground beef. When I put in the marinating ingredients one by one into the beef and tried to stir, it came together as a hard lump and as a result I couldn't evenly distribute the marinating ingredients. I was thinking of squishing it with my hand but was worried that it would harden the meat. I would be grateful for any tips. I really enjoyed the "raw" lettuce in the fried rice. I've never tried putting lettuce in fried rice before. Thanks. If you see hard lumps formed during marinating process, it could be too dry. Add a bit water to loosen it up. My fiance made too much rice last night and I immedialtely thought of making this! Thanks for the egg tip- no wonder it had such a soggy consistency in previous attempts! My mom used to put a bit of worchestershire sauce, is this weird or incorrect? It's hard when your parents made all the traditional dishes when you're a kid and now as an adult I crave it but don't know how to make it! Thanks!